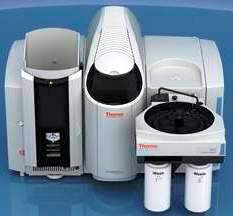 Thermo Scientific's iCE 3500 Atomic Absorption Spectrometer is a high performance, dual flame/furnace atomizer, double-beam Atomic Absorption Spectrometer. The iCE 3500 AA Spectrometer provides outstanding performance, flexibility and simplicity. The unique dual atomizer design allows automatic, efficient, safe switching between flame and furnace analyses. Superior optics, innovative design and background correction accuracy ensure analytical performance.